the bloody stupid johnson hat is coming along. 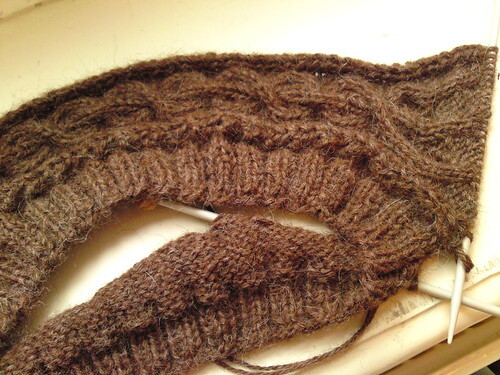 i really enjoy this pattern, the cables are easy, but with enough variation to make it interesting. the alpaca yarn really is soft and very nice to work with. i do suspect that the hat might turn out a bit on the large side, but that’s ok, large and warm hats have been put to good use this winter, and the cold and snow doesn’t seem to go away in a hurry. which i’m very grateful for, i love this weather! i wasn’t convinced that intarsia knitting was my thing. 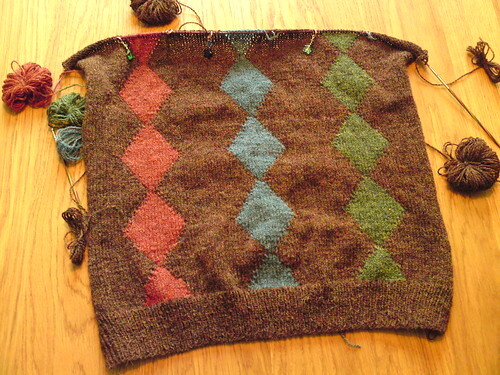 the stitches became uneven on both sides of the colour change. i consulted several knitting books to try to remedy the ugly stitches, but none of them mentioned this problem. i resolved to just make sure all strands of yarn were very tight at the colour change, and now it actually looks pretty good. i might consider using this technique again, if i’m sufficiantly motivated by a good pattern, but all in all, i prefer fair isle colourwork to intarsia any day of the week. but the vest is coming along, i’m about to start the under arm decreases on the front (back is already finished, plain stocking stitch with no colour work), but became distracted (how unusual!) while surfing ravelry. 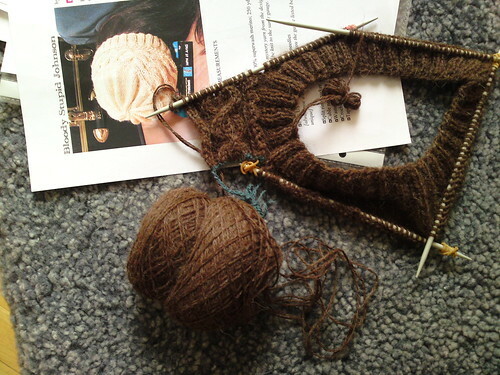 i was reading the ankh-morpork knitters guild forum and happened upon someone mentioning working on their bsj. now, bsj in the knitting universe usually refers to the baby surprise jacket by elizabeth zimmerman, but when you’re in a forum dedicated to the brilliant works of sir terry pratchett bsj obviously refers to bergholt stuttley johnson a.k.a. bloody stupid johnson and in this particular case; a pattern for a hat inspired by said person and published in the 2007 winter edition of knitty. being a longtime fan of sir terry, how could i resist knitting a hat inspired by one of his discworld charachters? and it’s a very nice hat too! i did have some problems interpreteing the pattern at first, but now i’ve gotten the hang of it, and it’s coming along just fine. luckily i had a nice brown alpaca yarn in my stash already, which i bought a few years ago at la droguerie in paris, so was able to cast on as soon as i got home from work on friday. i’m using the yarn double throughout. in just a few days, it’s once again time for the olympics! yes, there will be skiing, skating, bobsleighing and… knitting, of course! that’s right! it’s time for the knitting olympics! i’ve signed up for team sweden on ravelry, and i’ve decided to compete in the mittens moguls event which means that i will be knitting a pair of mittens! it’s been a while since a made any mittens, so i figured it’s about time i knit a new pair. i will cast on on february 12th and need to finish before the vancouver olympics close on the 28th. i’ll let you know more about my mittens later this week. well, that’s all for now! happy knitting!